A well-thought out design takes differing elements and anchors them firmly with strong unifying features. How could windows be more different than these cake-tiered three? The bottom is, of course, a protruding bay window with its own eaves and corbels. A dark blue accent adds interest above each window. The next story up is a visual breather between the top and bottom windows, and is unadorned except for a fine swag-like extra trim piece over the top and partially down the sides. 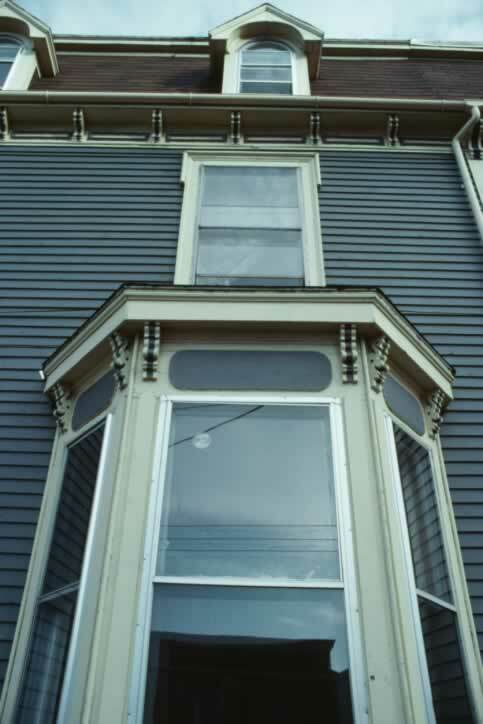 The top window reverses some bay window features since it's recessed into a mansard-like dormer, with curved elements at the top rather than the sides. The anchoring elements of the design are the strong horizontal lines created by the clapboards and triple eaves, and the dark blue or brown backgrounds for the light window frames. Identical double-hung windows also unify this stately facade.